When you are traveling, it can be difficult to know what kind of hotel you want to stay in. While you can always choose the most expensive option, that doesn’t mean that your stay is going to be more comfortable, because many expensive hotels charge more simply because of their location or in order to pay for their expensive remodels. If you are going to be in Plano for more than a few days, you should stay at Studio 6. Our extended stay hotel is better than other kinds of hotels for many reasons. 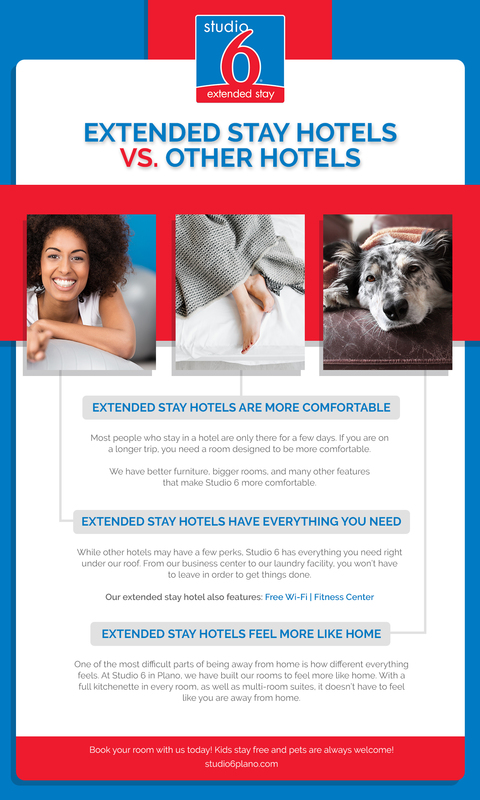 Read on to learn about just a few of these reasons, and then check out our website for pictures of our amazing rooms and more information about our amenities. When you’re ready to book your room, give us a call. We look forward to having you stay with us. Most people who stay in a hotel are only there for a few days. This means that many kinds of hotels just have to give you the idea of comfort because by the time you would start to notice that the rooms aren’t big enough or that the furniture is a little hard or poorly made, you’ve already checked out. If you are on a longer trip, you need a room designed to be more comfortable. We have better furniture, bigger rooms, and many other features that make Studio 6 more comfortable. Another aspect of our hotel that makes it more comfortable is how close we are to everything you may need when you’re visiting our fine city. We’re located near many different restaurants, shopping areas, and schools, so no matter what you are in town for, it is never far away. While other hotels may have a few perks, Studio 6 has everything you need right under our roof. From our business center to our laundry facility, you won’t have to leave in order to get things done. This means that you can make the most of your time, which we know is precious. Free Wi-Fi. Get your email, check your social networks, and stream your favorite entertainment right in the comfort of your room. A fitness center. Don’t forget about staying in shape while you’re away from home! One of the most difficult parts of being away from home is how different everything feels. At Studio 6 in Plano, we have built our rooms to feel more like home. With a full kitchenette in every room, as well as multi-room suites, it doesn’t have to feel like you are away from home. Cook your favorite meal, brew a cup of coffee in the morning, or relax on the couch just like you would at your place. Book your room with us today! Kids stay free and pets are always welcome! We know that you’ll love our hotel from the moment you check in until the moment you leave.